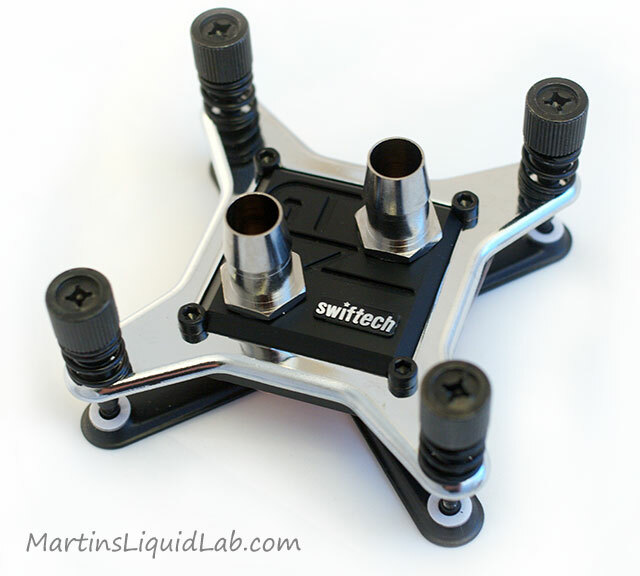 Welcome to my review of the Swiftech Apogee GTZ CPU water block designed for a wide range of processors. This is an actual production run copy that comes standard with an LGA775 mount. First I would like to give special thanks to Gabe and Stephan from Swiftech for providing the product sample. 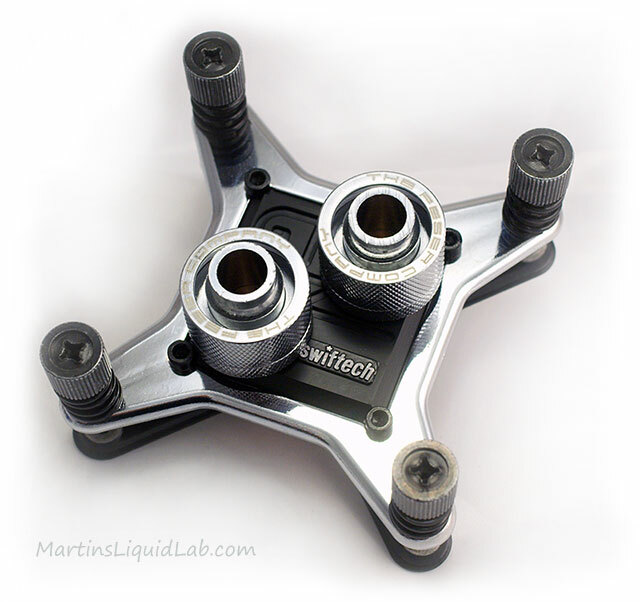 Swiftech is a well known water cooling parts manufacturer specializing in a full spectrum of products. 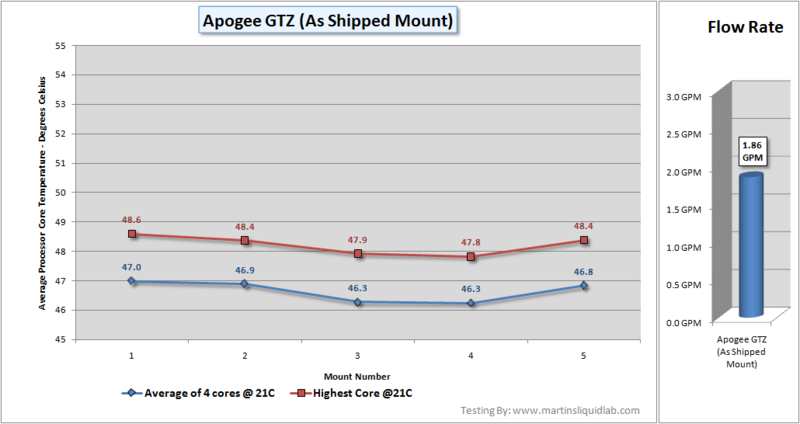 With this review I am looking at their latest flagship waterblock, the apogee GTZ. Throughout my past reviews, I've alwasy tremendously appreciated swiftech's product performance specifications they include with their products. This gives me a chance to check my work, and I've been happily doing so many times with things like pressure drop curves. Every time I've done so, I've either come up with similar or even better numbers, so I have the utmost respect and trust in their performance specifications. I can only wish someday, that we'll have other manufacturers follow suit and publish similar levels of performance data. In addition, I've seen swiftech frequently visiting forums that I frequent, and it's been obvious to me their passion in this industry is intense. It speaks volumes to me to see them engaging with the water cooling community and seeking their input and sharing their insights as a manufacturer. In addition Stephan (Swiftech's thermal engineer) was very open to helping me understand the limitations of the DTS processor sensor and provided great insight to the science behind it. In the end it helped me make the decision to fix my ambient temperatures which helped my testing accuracy immensly. Secondly, I would like to give special thanks to Gary from Sidewinder Computers for providing me with the Q6600 processor to test with. Sidewider Computers is one of my favorite places to shop for water cooling gear. They carry a wide range of products at typically the lowest prices. And what is even more important to me, they are very committed to advancements in this industry and are very active in the community. I highly recommend you giving Sidewinder computer systems a visit on your next build! 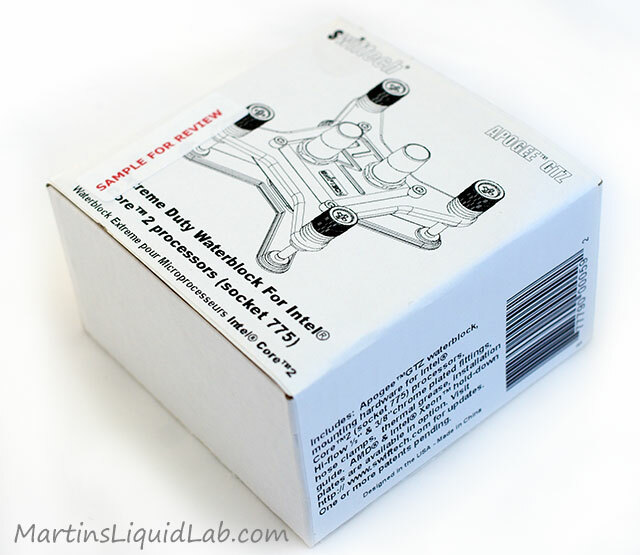 The block is a completely new design from Swiftech incorporating all of todays more advanced waterblock design features. Some of these include a jet nozzle plate focusing cooling at the core, a copper micro pin matrix base, and a special metal ring for bowing the base for LGA775 socket performance optimizatio..
First up for looks, the packaging and accessories. This is how the waterblock is packaged, it comes in a smaller than expected box with a simple black on white printing. I've never personally been a big fan of colorful packaging myself, it's very expensive and doesn't recycle as well as normal cardboard. The smaller size does worry me a little bit on potential damage during shipping, but from a cost standpoint it makes sense. The more you can ship in a smaller box, the lower the cost, I would simply recommend paying close attention to the mounting screws and ensure they havn't been bent from shipping abuse when you recieve your package. The shipped box is a bit smaller than I hoped, but the block is protected primarily by the retaining plate and mounting screws. Swiftech really goes out of their way to give you everything you can possibly need to install the block. Many blocks require you to make additional purchases like the backplate (which I think is absolutely necessary for every waterblock installation), not to mention the barbs, clamps, and thermal paste. Kudos to Swiftech for giving you an exemplary complete package with everything you need!! The base is a nice mirror finish, and bowed purposely about the X axis of the block to match the LGA775 CPU socket contact area best. When you take the block apart, you'll find several parts. The delrin top with a delrin nozzle fitting into the top, a stainless bowing frame that sits around the perimeter and the copper base. Here is a close up look at the underside of the GTZ top, the nozzle plate is a finely machined delrin peice that snugly fits into place. And here is a picture of the nozzle removed and setting on the copper base in the approximate working location. A portion of the flow is directed directly into the fine pin matrix and another portion works it's way around the perimeter. I wouldn't mind seeing another nozzle plate similialr to this that forces all of the flow into the matrix. That would of coarse make the block extremely restrictive, but it may provide additional cooling at the core. 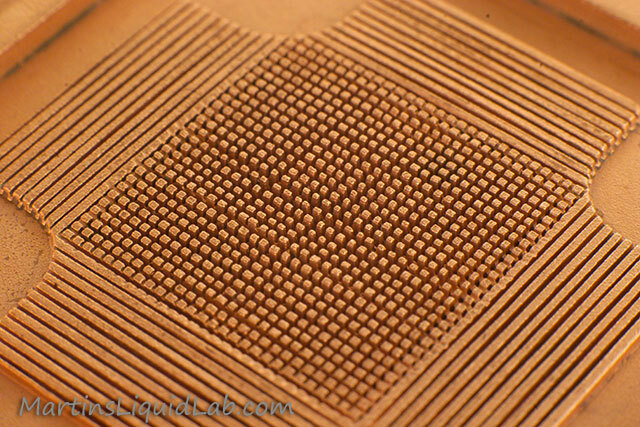 And here is a macro of the pin matrix. I did see a few burs left behind looking at the larger photo version, but the pins are so very small, you can't even see it with just your eyes. Overall it looks like the pins recieved a good bead blasting to help clean up machining burs and further roughen the surfaces. Down in the mddle of the matrix, the pins are roughly 2mm in height and ulra fine (too small to measure) in dimension. And this little metal ring with the step in the middle is designed for one thing, bowing the block correctly about the LGA775 socket. This maximizes block pressure above the cores which minimizes bond thickness of the thermal paste improving overall heat transfer. And by popular demand, yes the Apogee GTZ will fit compression fitting with a small trick. Because the top has recess barb slots for o-rings, you need to grab an extra o-ring from another unused barb and slip it over the comrpession fitting threads. Othewise the compression fittings will sit too low and impact the swiftech logo. Not a big deal though, just slip them over and tighten the whole thing down. I normally do pressure drop testing, but I just havn't finished that piece yet because I'm still doing thermal testing on other blocks that are using my flow meter. I did however measure the actual flow rate I was getting from the block which gives you at least a relative measure of restriction. This was measuring using my King Instruments Flow rate meter in the actual loop I've been doing all of my waterblock testing. 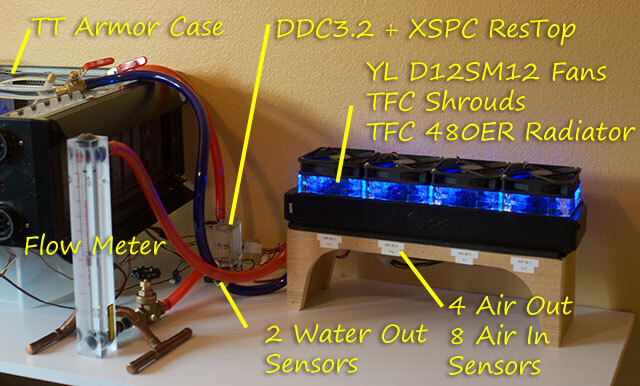 This includes an XSPC Reservoir Top on a DDC3.2 pump, a TFC 480ER radiator, and several lengths of tubing, along with some open valves and my flow meter. The results are good, the Fuzion V2 is probably more of an average restriction block and so is the GTZ, there are several other blocks with much higher restriction than this. In addition these flow rates are much higher than your typical >1GPM rule of thumb so the selected pump still has alot of reserve pumping power for additional blocks in this loop. I wouldn't hesitate to run the GTZ along with your other favorite GPU or chipset blocks. There have been some purposeful design tweaks in the nozzle present to minimize the amount of pressure drop of this block, and it's definately paying off here with the average restriction. Real World Full System Testing - Over time I developed a radiator testing bench that I've decided to incorporate into my CPU block testing setup. This gives me a full 8 air inlet sensors, 4 air outlet sensors, and two water sensors to much more precisely monitor everything. My testing occurs as close to the real world as possible, I just have a crap load of sensors on everything. I am testing on a processor, with a loading program, in a real world computer case, with a fixed pump, and a regular radiator setup. All of this helps include the little odd things that actually occur in a regular system. Intel Core 2 Quad Q6600 Kentsfield Processor - Overclocked to 3600 MHz, 65nm, Vcore = 1.472 under load. Motherboard is a DFI Lanparty X48 LT with 4GB of Corsair Dominator memory with fan module. The northbridge and southbridge chips are both watercooled. Video card is an EVGA 8800GTX, also watercooled. Case is a Thermaltake Armor, position is horizontal for easy block mounting case cover left off. 5 separate TIM applications and mounts averaged - This is not common, but extremely important. It's not uncommon at all to see mounting variations as high as 2 degrees or more, so with only one mount, that error is 2 degrees. When you mount 5 times and average those results, your standard deviation is significantly lowered and the overall testing confidence improved. In addition multiple mounts serve as a means to validate data, because each test is carried out again and again, chances are if some variable is affecting results, it will show. Logging temperatures - After several iterations of a new testing method I finally landed on logging of temperatrues for 1 hour. I then can simply start up the loading routine, and trigger on my two logging programs and walk away for an hour. I then come back and remove the first 10minutes for warmup time. The remaining 50minutes is then left to average out temperatures which are recorded every second over 18 active sensors plus 4 core temperatures. Logging is essential for higher resolution measurements. Our DTS core sensors are only resolved to 1C, however after logging that resolution out for 50 minutes of testing, that can be reduced significantly. In addition my ambient temperatures are held constant by an A/C system thermostat that actually makes the temperature swig up and down in a sawtooth like fashion over a 2C limit. Logging this sawtooth occurrence over a long period of time also levels out the ambient to a nicely resolved level of accuracy. 4 ea Q6600 DTS sensor these were logged using Core Temp Beta Version 0.94. I chose this particular version because it stacks logged data cores in separate column which makes integrating into my crystalfontz data much easier. Crystal Fontz logging is accomplished through the use of their Cyrstalfonts 633 WinTest b1.9. Only special settings are turning off all packet debugger check boxes to avoid paging the processor. The Dallas DS18B20 Digital one-wire sensors that were used as noted above have a specified absolute accuracy of .5C with a .2C accuracy between 20 -30C temperature range. They also have resolution down to .0625C which is very good, and because they are digital they are not affected by the wiring or length of wire like thermocouples are. The CrystalFontz CFA-633 is an LCD with up to 32 channels of monitoring and logging capability. It logs temperatures of each channel on a one second interval, so over a 30 minute test, I'll have about 1,800 entries noting time and temperature of each channel. These are then averaged for a fairly accurate number. 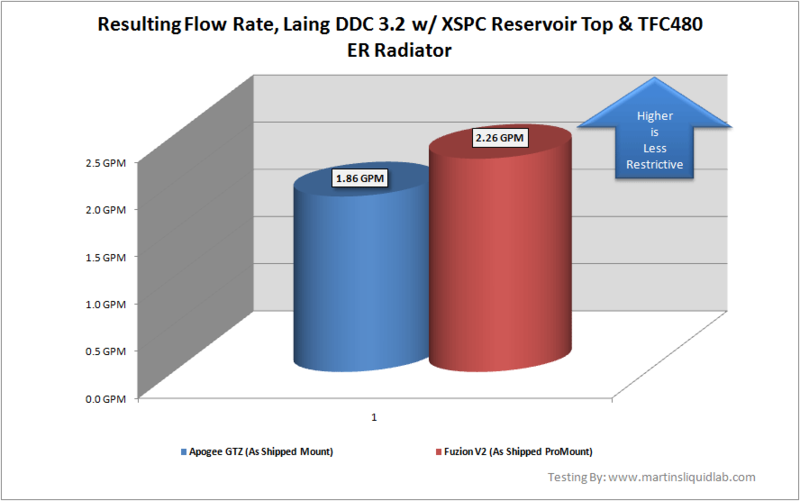 Pump - Laing DDC3.2 with XSPC Reservoir top. I think this pump represents the pumping power available to many users and gives a fair amount of strong pumping power. This top rated near the top in my pump top testing and is very powerful. Radiator - The Feser Companty (TFC) 480 ER radiator with Yate loon D12SL12 medium speed fans at 12V with TFC shrouds in pull condition. This is an extremely powerful radiator and was purposely chosen because the smaller water/ambient deltas reach equilibrium fast and pressure drop for this radiator is minimal. This provided me very short warmup periods and ensured maximum pumping power for the CPU blocks being tested. TIM Material - While I really like the TIM consultants TC Grease 0098, I found the thicker consistency wasn't helping with mounting consistency and required user effort to seat the block down. For that reason I chose Artic Cooling MX-2, it's been very popular in the forums and preliminar testing showed to perform well, it's noted as non-curing, and more importantly is a thickness/consistency that more accurately represenst most thermal compounds and easily applied and removed. I felt this was important to maintaining a higher level of repeatability. There was no cure time allowed for the compound (even though it's noted as a non curing compound). Testing was started immediately following block installation. TIM installation method is the thin line method. Hardware - I've change my review process to include testing of two options. First an "As shipped" option that includes what you get in the box with the block, nothing more. This forces me to make due and use the hardware included and provides users some evaluation and performance of what you get straight from the box. In addition I plan to use a fixed hardware scenario to more closely look at the block only. Prime 95 Load - I used Prime 97, torture test, Custom, Min FTT 8K, Max FTT 8K, Run FFTs in place checked ON. This is an easy to use and constently loading program. It provided the most consistent loading I could find for quad cores. Lapped IHS - My Q6600 has been lapped flat down to 1200 grit to ensure a true and flat surface. The stock intel IHS can be very irregular, some are convex, some are concave, some are wavy, and some are fairly flat. Lapping a processor voids it's warranty, but it ensures a nice flat surface for optimal heat transfer. My particular processor has been lapped. A complete stock IHS may benefit more from a bowed block than my samples because it is flat. Fixed Ambient Temperature - My recent roundup of block testing brought forth that regardless of measuring water temperature you will in fact still incur testing error of the processor core temperatures if you allow ambient temperatures to fluctuate. I found on the order of .2 t .3C error for every degree in ambient difference, although it was too variable to pin down and appropriately correct for. In the end I decided on buying a window A/C unit that holds all testing to the same temperature. Ambient do go up and down as the thermostat kicks on and off, but the overall average temperature over a long logged test has been holding to less than .5C which is very good. I am running a Hair 8,000 BTU thermostatically controlled A/C unit in "Cool fan on at all times" to keep temperatures right at 22C. Since my last big testing included the D-Tek Fuzion V2 being one of the best performing blocks out there, I figured why not show a comparison to that. So I retested the Fuzion V2 stock with the as-shipped Fuzion Promount and backplate and came up with the following 5 mount comparison. 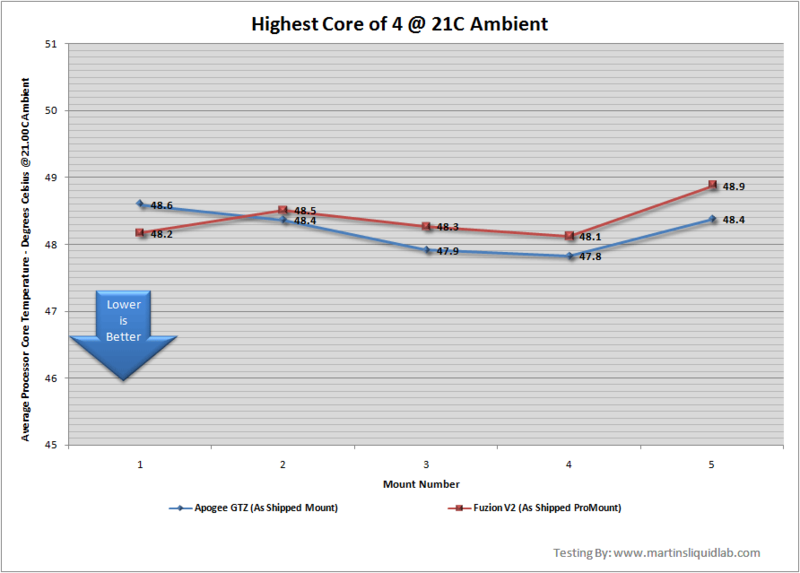 This chart shows the average temperature across all four cores. Mounting variences are about equal but perhaps a touch more consistent with the GTZ. 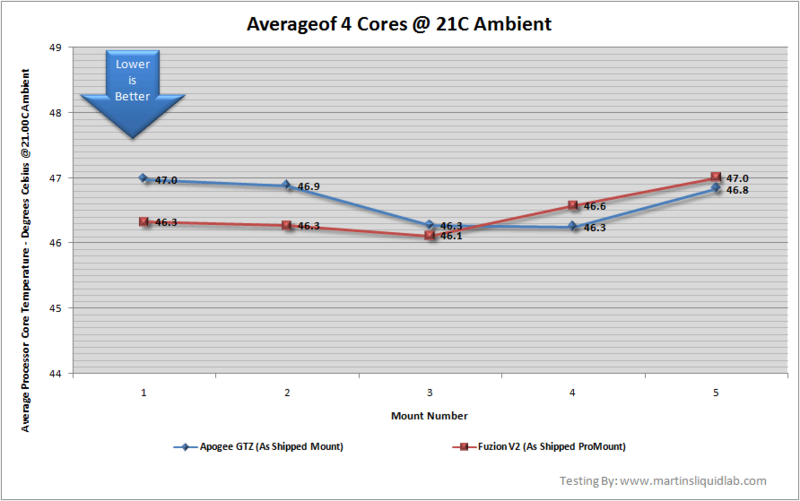 This graph is similar except it picks out the hottest of the four cores and compares them. Amazing, both blocks are obviously reaching a bit of a barrier on thermal efficiency here, both are performing exceptionally well, and both from a statisitics perspective are equally the same in performance. The amount of variency in mounting error creates a standard deviation that is higher than the differences between the two blocks, so I'm unable to say anything more than they are pretty much the same in thermal performance. I would suggest you take other factors into account to help you decide between the two blocks. I created a separate section for this block because it's so incredibly fantastic and the mounting mechanism is extremely important! 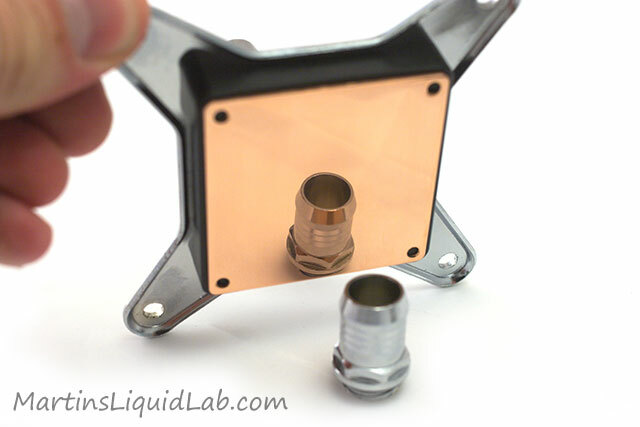 One of the biggest pains about waterblock testing is the variability with different mounts, with a poor mount you can easily see several degrees lost simply due to a bad mount. For this very reason is why I test with 5 mounts, it's a real pain and a real problem with most blocks. Even after becoming very experienced with mounting waterblocks it's still very difficult to get repeatable good mount results from most of the waterblocks today. For starters, a fair amount of waterblocks today don't even come with a backplate. 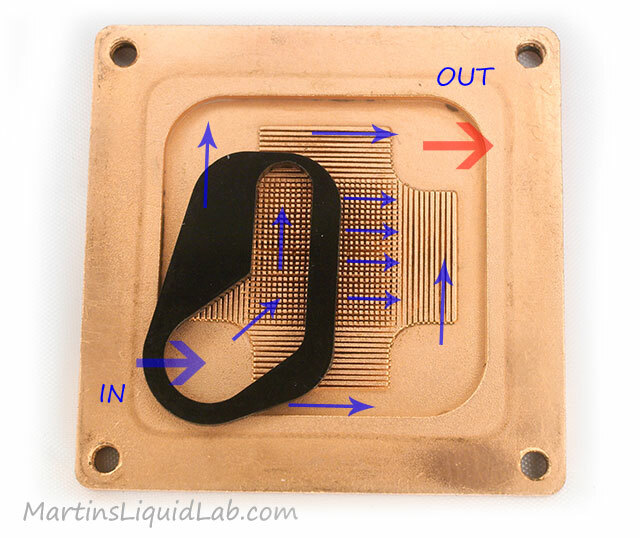 Running a waterblock without a backplate is not a good idea, because over time it will put a tremendous amount of stress on the motherboard around the socket. In addition mounting pressure is a key element to a good mount and has been shown to provide significant benefits. Finally, one of the plaging problems with the 4 bolt mounting system is the possibility for the user to tighten one side of the block down more than the other. 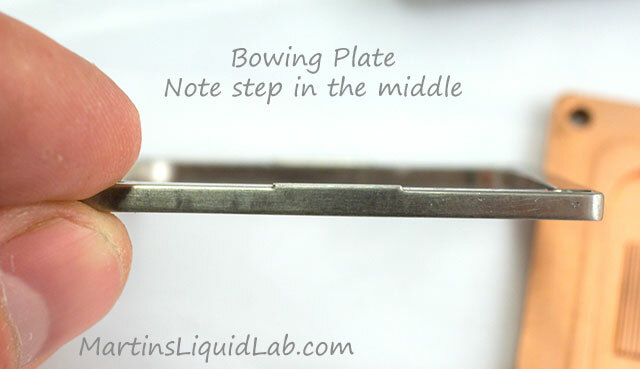 This problem only becomes aggrevated with stepped or bowed bases where mounting consistency becomes very poor particularly for new users that are not experienced in knowing what to look for. These are some of the key retaining system elements and why they are so great. 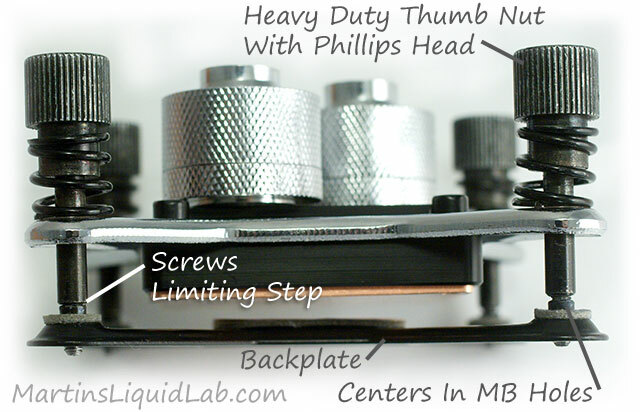 Large Thumb Phillips Screws - When you first mount a block you want to be careful to start all the threads down at the same time so the block makes perpendicular contact and spreads the thermal paste evenly. These larger thumbscrews provide a much more desireable contact for your initial finger tightening. Then as you get further down, you can switch over to some large philips head screwdrivers and really gain alot more power and control in your hands for tightening. Screw Limiting Steps - In addition these screws are purposely stepped and limited, so YOU GET A PERFECT MOUNT EVERY TIME!! This step ensures that each screw has been tightened with just the right amount of force and perfectly planar to the block, motherboard, and processor. This eliminates any chance the block will be pulling harder on one side vs. the other. 5 Point Self Adhesive backplate - The proprietary backplate that comes with the block has 5 points of adhesion that keeps the backplate put when removing the block, so you don't have to remove the motherboard any more than the first install of the backplate. You can easily remove the block for servicing or changing out of the processor and remount the block. Self Centering Backplate - The backplate has raised threaded stubs that fit perfectly into the motherboard holes and helps line up the block and backplate that much more. This results in even more precision on getting the block perfectly lined up on the processor. Heavy Mounting Pressure - The heavy duty springs included in the GTZ along with the mounting screws provides a High amount of pressure to the CPU IHS. I would estimate this is in the 50-60lb range. Generally the more mounting pressure, the thinner your thermal interface layer and the better the overall thermal performance. It works and it's part of the package. Integrated/attached hold down plate, tighting screws, and thumb screws. I can't even begin to tell you how many times I've lost a washer or a thumbnut under my motherboard when mounting a waterblock. The sheer thought of that little metal part shorting out my precious MB is enough to force intervention and many times frustration, possibly even to the extent of having to removel the motherboard to get at that lost little part. NO MORE LOST WASHERS/NUTS/HARDWARE!!! 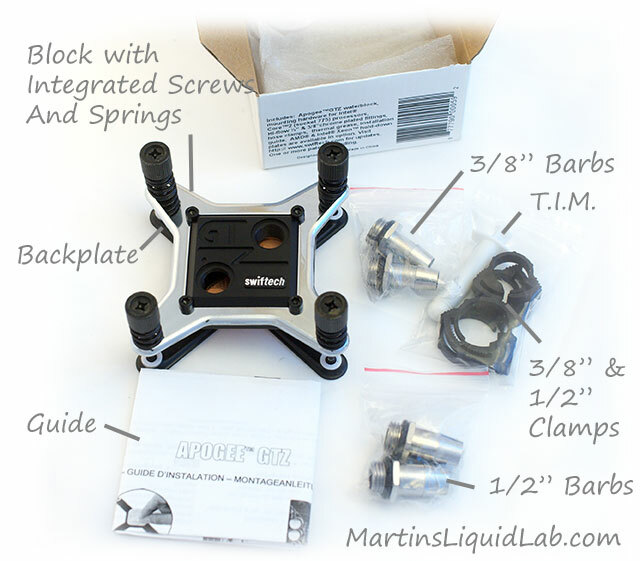 It's all inclusive, the screws, springs, and hold down are all firmly attached to the waterblock so there's no little parts to be lost...it's all right there ready to tighten for you. What a relief...finally a solution for people that are all thumbs like myself!! I simply cannot emphasis enough how awesome this mounting mechanism is. It makes a pro waterblock installer out of everyone no matter what experience level you have. It's simply a dream to install. KUDOS TO SWIFTECH FOR MAKING THE BEST MOUNTING MECHANISM EVER!!! The BEST MOUNTING MECHANISM TO DATE! !, this not only allows a perfect mount , it does so with high pressure and easy to reproduce for all users. One of the most COMPLETE ACCESSORY PACKAGE I've seen. Average Restriction. Not very restrictive and will work well with multiple block loops or smaller pumps. Back-plate is and all accessories needed are INCLUDED!!! VERY NICE!! Delrin (Black Acetal) top, steel hold down, and brass screw inserts ensure long term durability. High quality oversized metal barbs in both 1/2" ID and 3/8" ID tubing sizes. High quality fabrication, overall quality is superb. Pro mount requires motherboard removal if installed using front mounting screws preinstalled. Packaging in a smaller box with minimal padding may result in some shipping damage on extreme cases. The new Swiftech Apogee GTZ is not some simple cometic upgrade from the GTX. It is an all new nozzle focused, extreme water block cooler with an EXEMPLARY MOUNTING MECHANISM. It appears to be a great design for many processor core types and purposely balanced in flow/restriction performance to allow flexibility in installations for both single block CPU loops as well as multiple block loops. 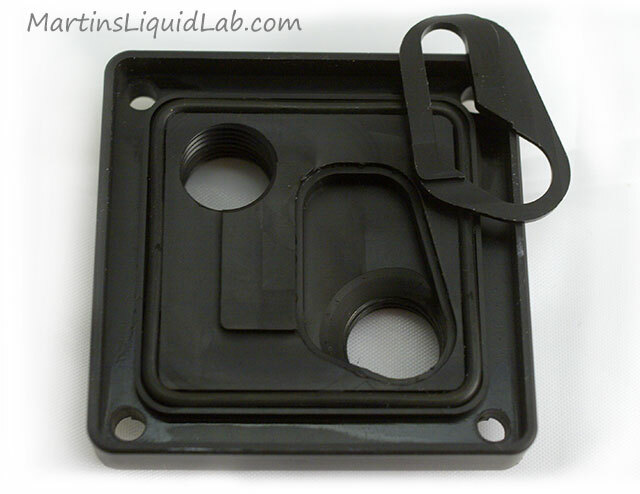 The new top uses well regarded black acetal/delrin, so durability is excellent as well. Did I mention the mounting mechanism?... :) It's awesome!! !